The H-700 is designed for vertical flow (not suitable for down-flow applications). The disk shaft is fully guided to insure proper alignment between disk and seat. The disk and seat are accurately machined for precise seating. An optional resilient seat is available for drip tight shut-off. 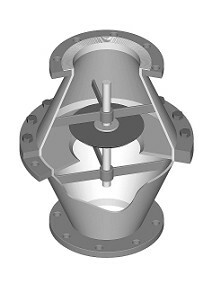 The valve has an angled body design to provide full flow area, and has a two-piece body to facilitate maintenance. The H-700 can be fabricated from any weldable alloy and is clearly marked to show direction of flow. 3″ to 36″ is standard, but larger sizes are available.